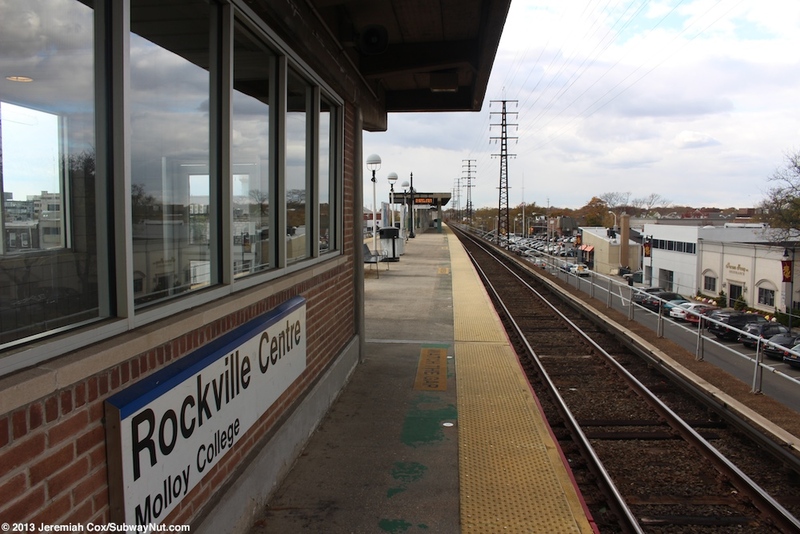 Rockville Centre is the easternmost station on the Montauk Line (Babylon Branch) after the Atlantic Line separates from it for a final time and becomes the Long Beach Branch heading south. 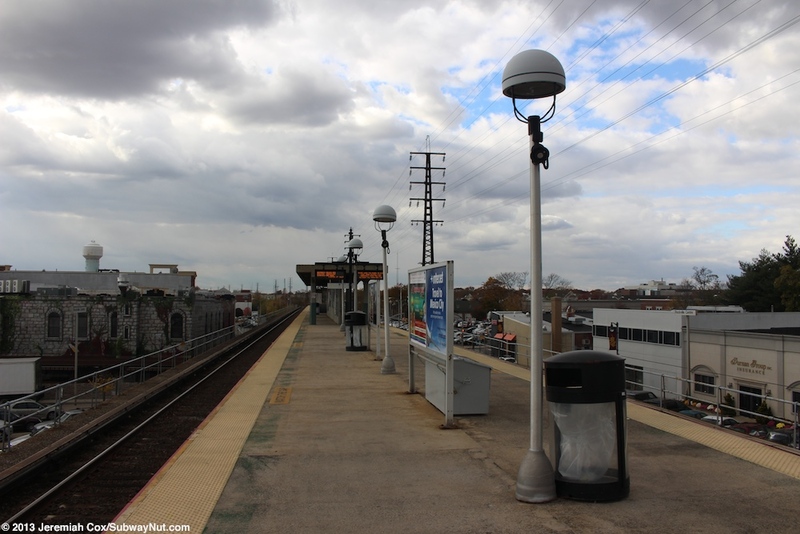 The station is the easternmost one (although timetables include Lynbrook but only for the Babylon Branch trains that stop there) on the Babylon Branch timetable. 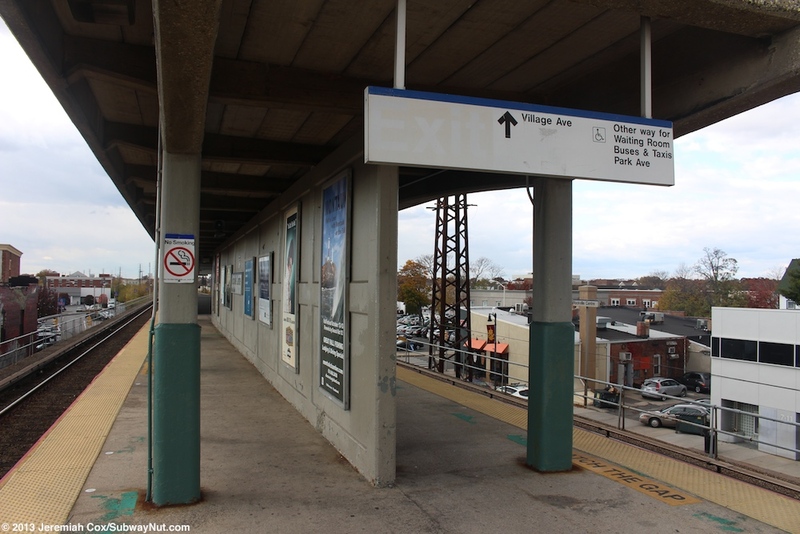 The stop has the normal elevated on a concrete guideway two tracks with a long island platform that can accommodate 12 cars. 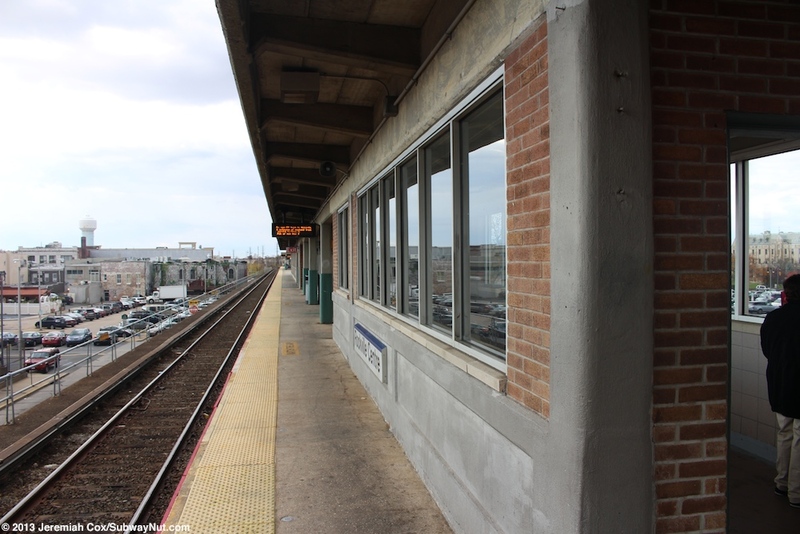 The supports that hold up the station are a series of Octagonal beams. 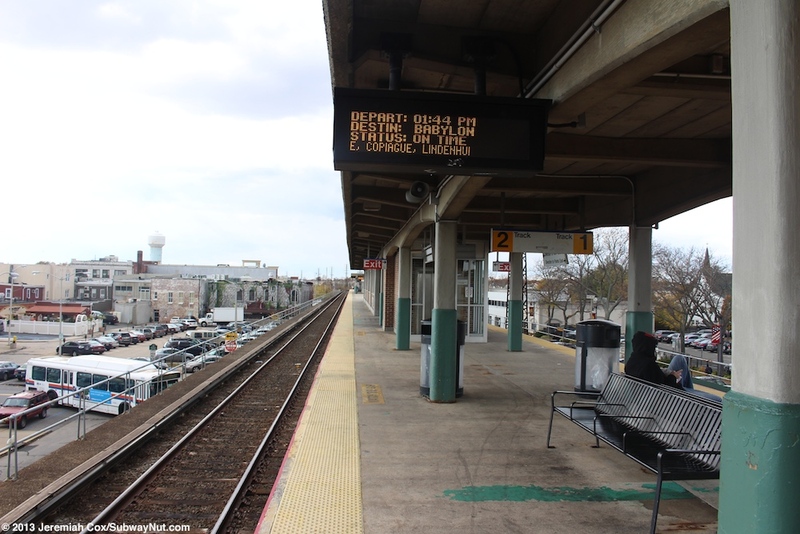 The current elevated station opened on July 18, 1950. 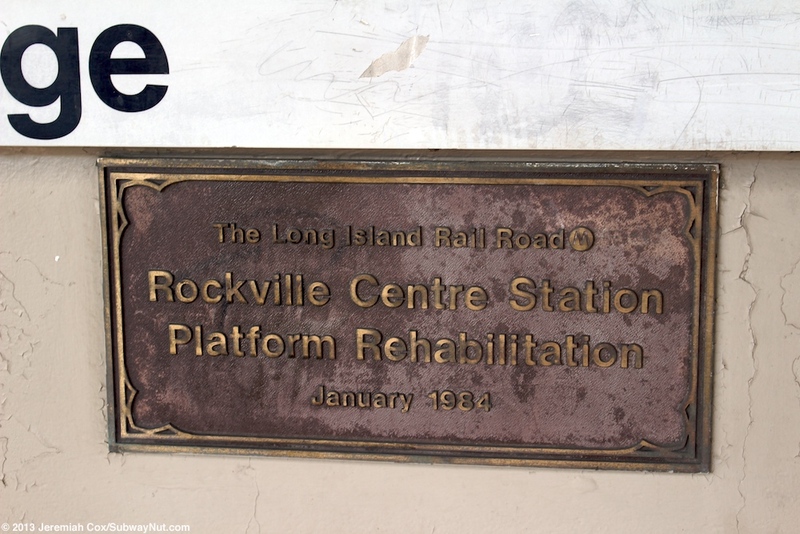 A plaque on the platform says Rockville Station Platform Rehabilitation: January 1984. The platform has canopies along the eastern half of the platform and a secondary one in the middle of the western half. 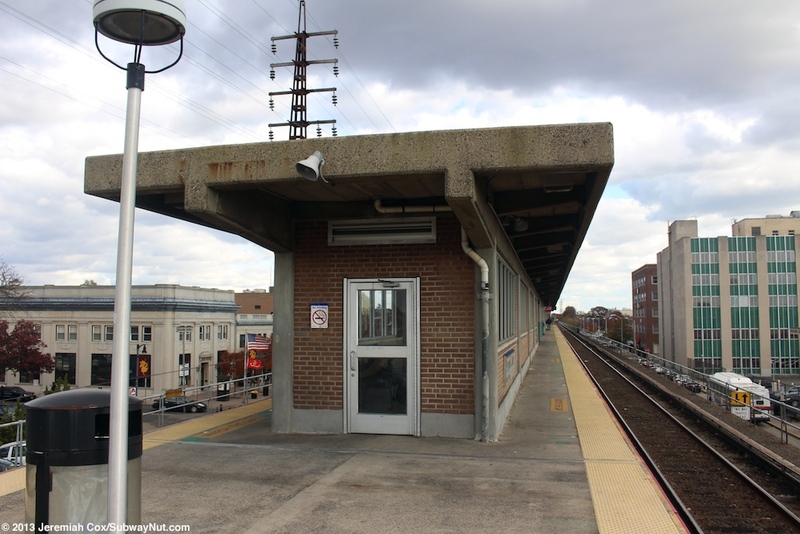 These canopies are made of concrete and two sets of small concrete supports along the edges of each platform hold it up. The base couple feet of the support pillars are painted green adding a bit of color to the platforms. 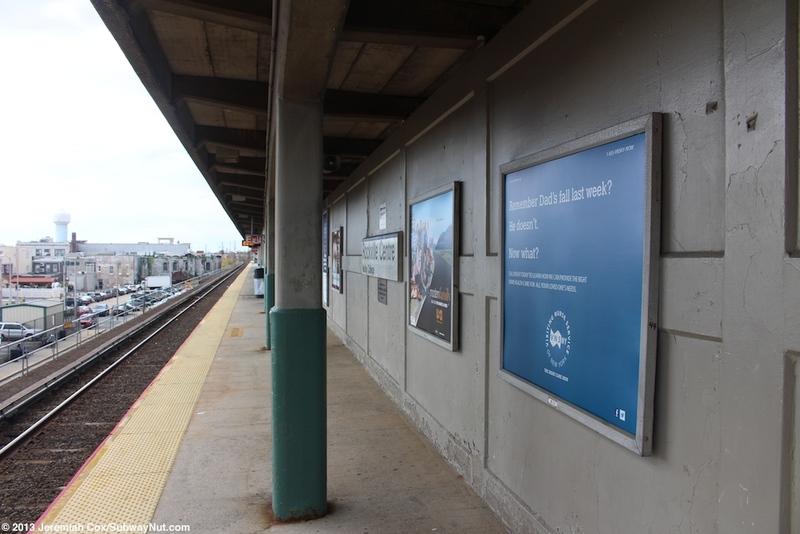 In the middle of the platform (at the beginning of the longer canopy structure) is an on platform waiting area. 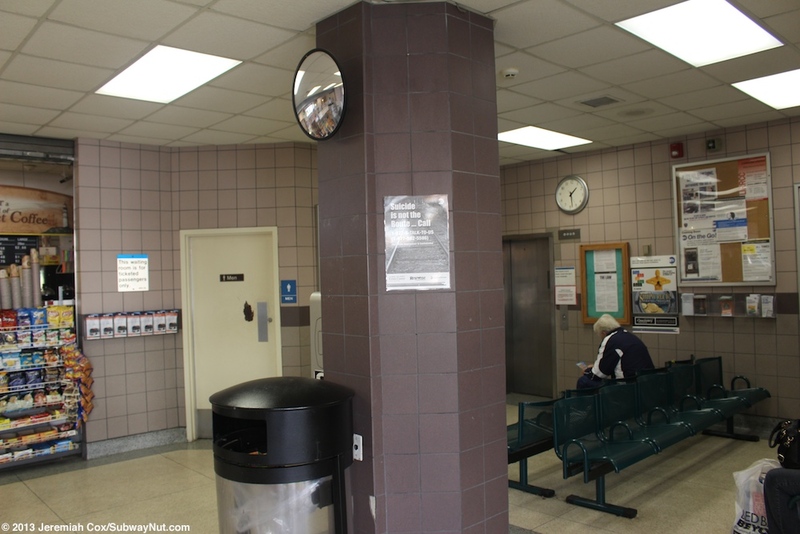 This waiting area is about a car length and has exterior brick walls with Plexiglas windows. Inside is a not too good smelling waiting room with some black benches and purple tiled walls. Each canopy for about a car length has a full height concrete wall in the middle of the platform that I suppose is designed to act as a bit of a windscreen. On the platform just east of the on-platform waiting room is the station house nestled beneath the tracks at street level. Front Street runs along the northern side of the station and South Station Plaza along the south side. 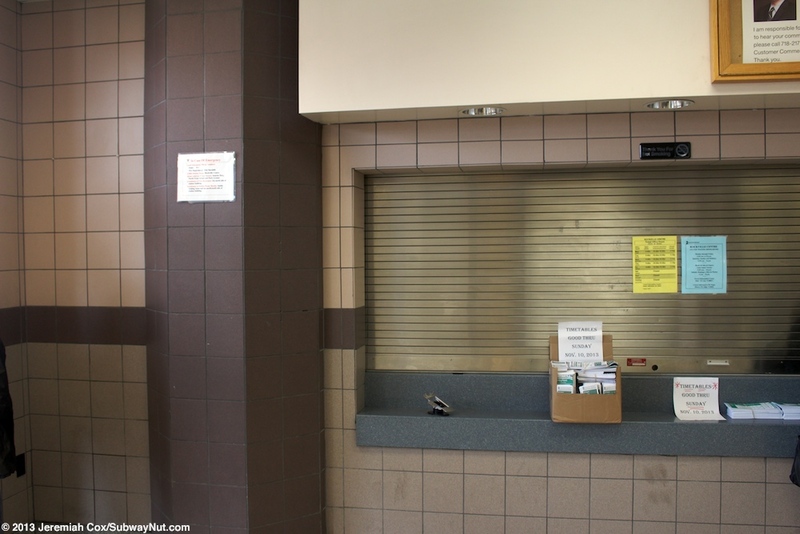 This brick building contains a small waiting room with purple walls open all day 7 days a week with a ticket office opened from 5:40am to 1:15pm weekdays. TVMs are only available (none are on the platform) at street level outside the station house. 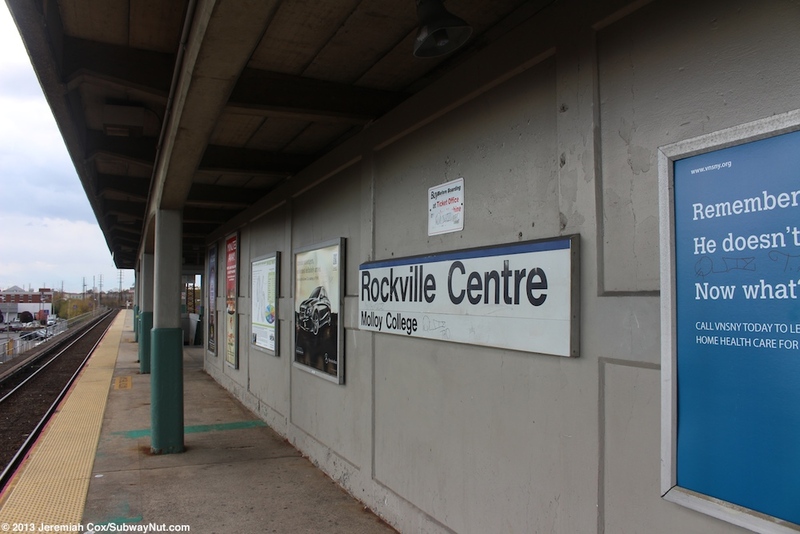 The main entrance to this building is along the north side (Front Street) with a green awning that has Rockville Center and Long Island Rail Road written in gold letters. 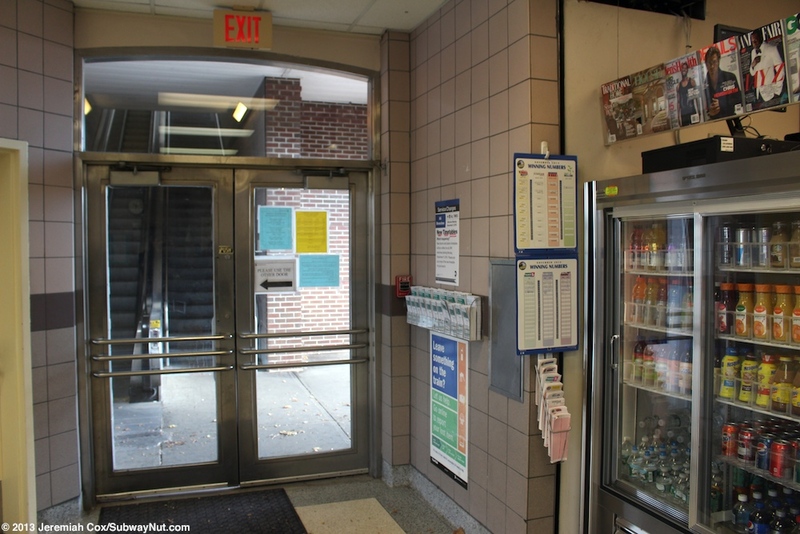 The major tenant of this room is a large convenience store/newsstand that includes products like selling cold drinks/coffee (and is open through the afternoon-evening). 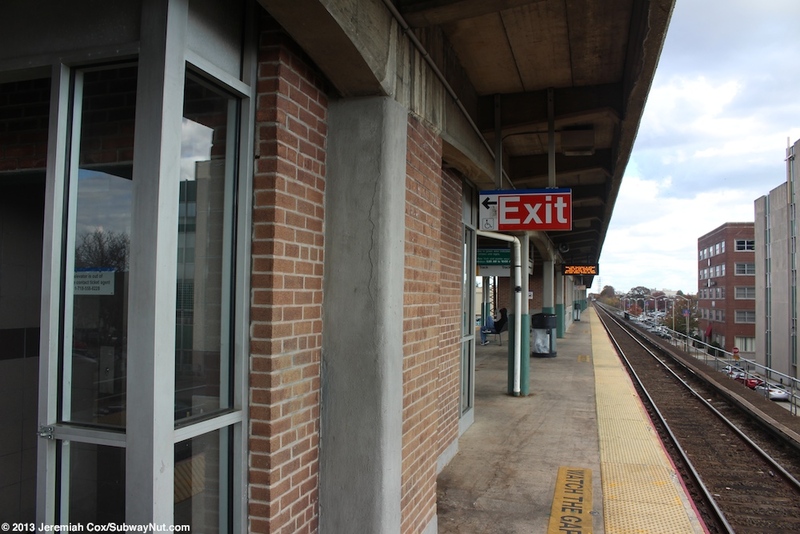 On the west end of the waiting room is the station's elevator (arriving at the platform just east of the on platform shelter). This elevator is a bit unusual because it has two doors at each landing. 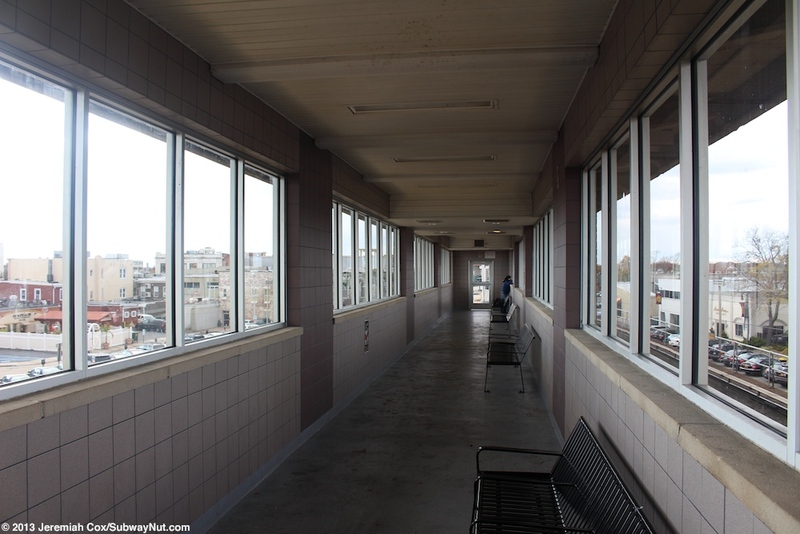 On the platform this elevator has doors facing both directions in a brick elevator shaft. 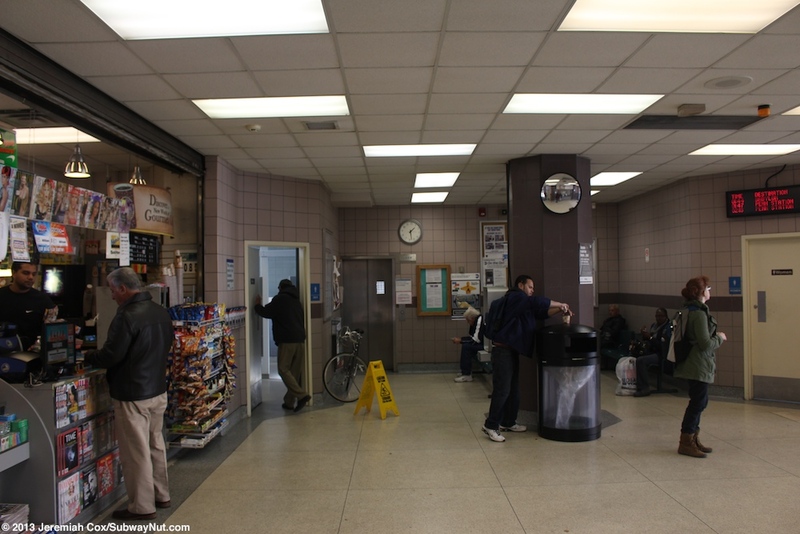 Down at street level there are two elevator doors, one leads directly inside the waiting room, the other directly out to the street to a connecting driveway beneath the tracks just beyond Clinton Avenue dead-ending from the north at the station house. 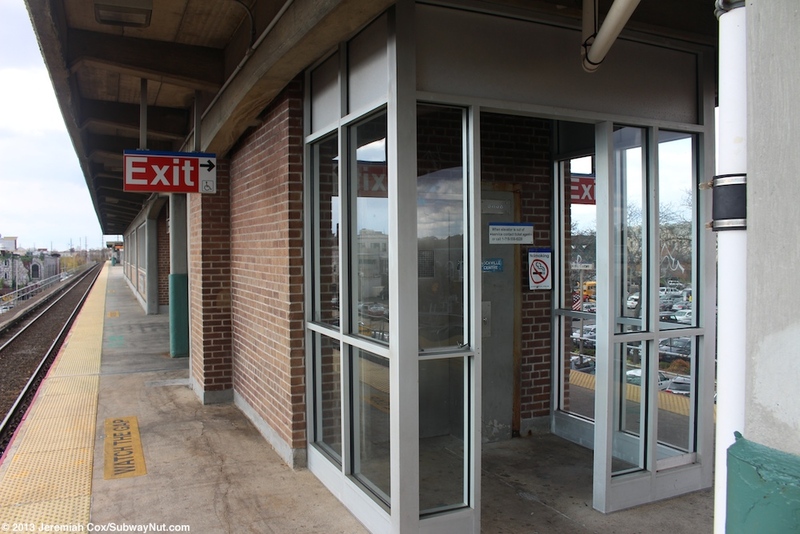 The east end of this brick building along the south side has doors into an outdoor alcove that lead to a staircase and narrow up escalator up to the platform (arriving enclosed in a brick enclosure with glass). There are three other staircases up to the platform. 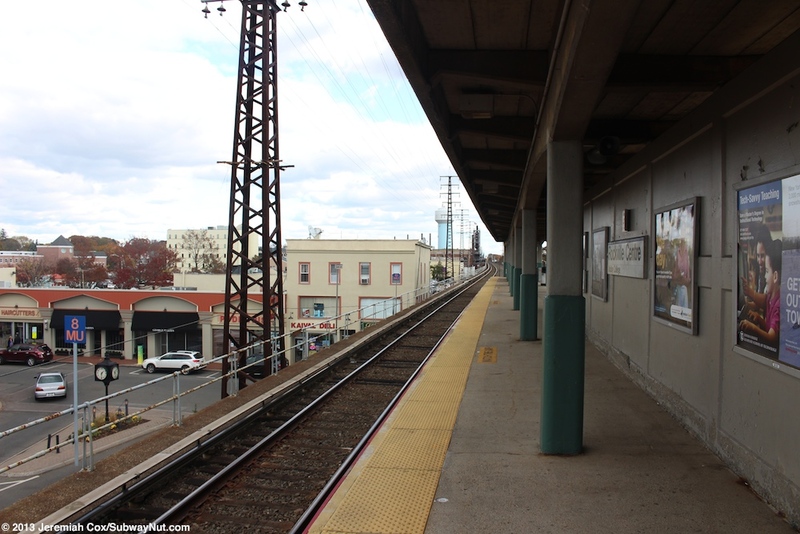 One is at the extreme eastern end of the platform and leads up from the east side of Park Avenue (which crosses under the eastern end of the station). Village Avenue crosses under near the western end of the platform. 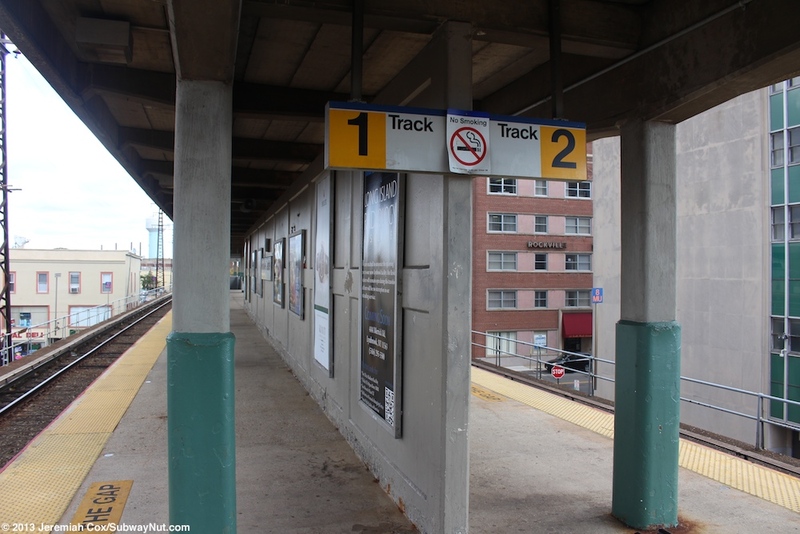 Here a staircase leads up from the east side of the street to the western end of the smaller western platform canopy. 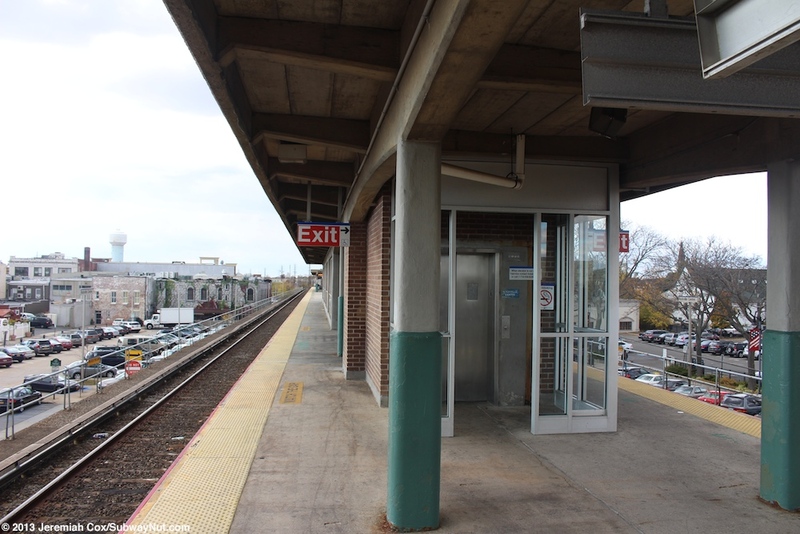 At the extreme western end of the platform is a unique narrow staircase that leads down before splitting into two staircases east of Village Avenue that serves the small parking lot on this side of the tracks. 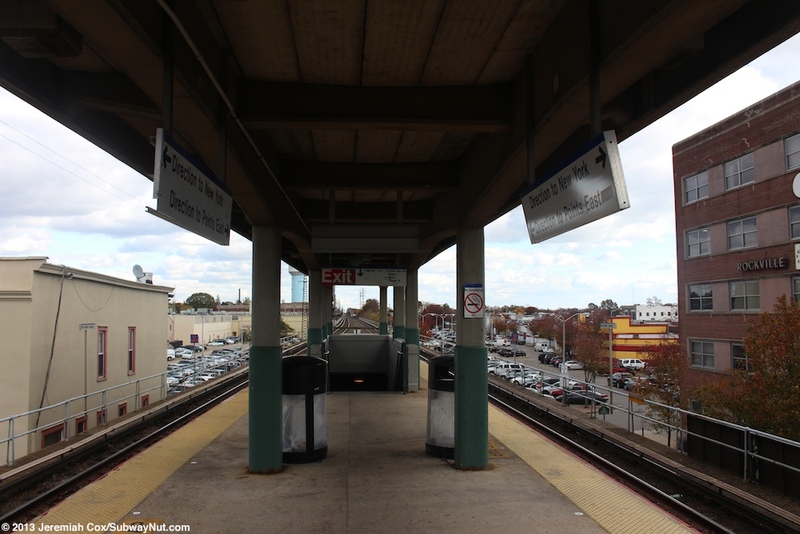 Additional commuter parking is scattered about under and near the station with the largest lot across Park Avenue (stretching to Morris Avenue) beyond the eastern end of the station.